Join your neighbors and park visitors at the McKinley Water Vault public scoping meeting Monday, June 19 from 6 to 8 p.m. at the Clunie Center Grand Hall. The public scoping meeting is an opportunity for the community to officially comment on issues to be included in the Environmental Impact Report for the proposed project. Right now, during big storm events when the City’s combined sewer system exceeds capacity, mixed storm water and wastewater flows out onto nearby, low-lying streets and properties. The McKinley Water Vault is a large, underground cistern that will reduce wastewater and stormwater outflows from the combined sewer system. 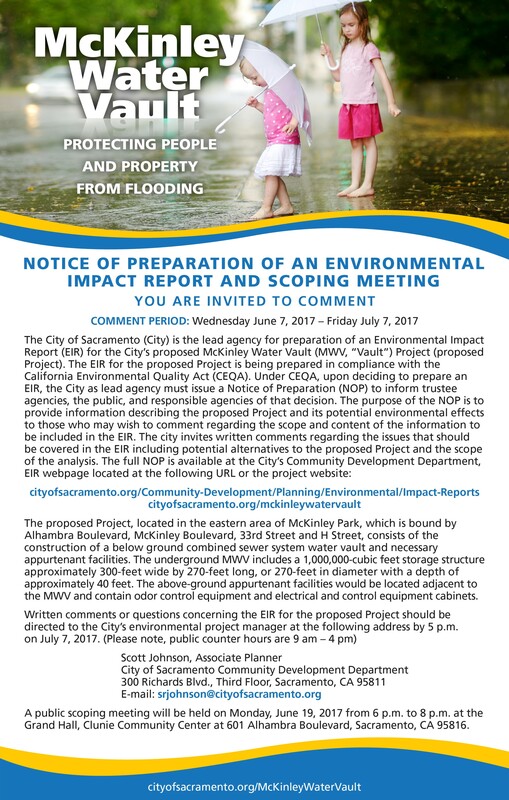 This project will significantly reduce street flooding in East Sacramento neighborhoods and in McKinley Park during these large storms. Please see the meeting postcard for additional information on the scoping meeting. Visit McKinkley Water Vault or call 916-808-5545 for more information. Stay involved by signing up for email updates. Review the Notice of Preparation.